My makeup bag consists of the essentials. I like to keep it simple and easy without carrying around a whole bag of chunky products that take up to much space. This is what I carry around with me every day in my makeup bag! My makeup bag is the "Pretty In Paradise" by Rebecca Minkoff that I got it in my June Ipsy Bag. This makeup bag is so well made! Its really durable, holds a lot, and the fabric has a silky waterproof feel to it. Its the perfect size for all my essentials and the design is absolutely adorable! One of my favorite products is my "Dream Beach Waves Beach Spray" and "They're Real by Benefit Mascara". The Beach spray is perfect because it gives your hair a little volume, a little texture, and a little hold. Its basically an all in one product that is perfect for out and about! "They're Real by Benefit" is my all time favorite mascara so of course I have duplicates of this lovely product! I always keep a sunscreen on me! SPF is so important! I switch out brands often because I am always looking for little on the go travel size sunscreens so it just depends on what I find. I am currently using the "Pur-Lisse spf 30 Sunscreen Protecting Moisturizer". Its got blue lotus, white tea, soy proteins, sea silk, and lupine peptides. In english its calming and soothing for sensitive skin. It absorbs quickly, its not greasy, and its super moisturizing. I always keep a concealer on hand! I like the "Almay Clear Completion Concealer" in my on the go bag because its a really inexpensive concealer that works great and has good coverage. Its not my all time favorite concealer but its definitely in my top 5 so its perfect in my makeup bag. For eyeshadow I LOVE the "Mac Shroom Eyeshadow" and have duplicates of this product as well. I keep one for on the go and one in my makeup drawer. This eyeshadow is super versatile and can be used along with another eyeshadow or by itself looking great either way. It is super shimmery and I love the way it looks! I also keep a mini pallet that has a variety of matte and shimmer eye shadows. I love the shimmer gold and the matte white. The colors are great, high pigmented, and long lasting which I dig! In addition to eye shadows I keep a "Ben Nye Eyebrow Pencil" on me always! Eyebrows are my favorite so I always have a back up. I just upgraded from my "Revlon Color Stay Liquid Eye Pen" to the "Benefit Push Eyeliner" so I popped my Revlon Color Stay in my bag. Its running low but for a touch up still works great! For brushes I like these little Mark travel size brushes. And I always keep an extra set of tweezers on hand! 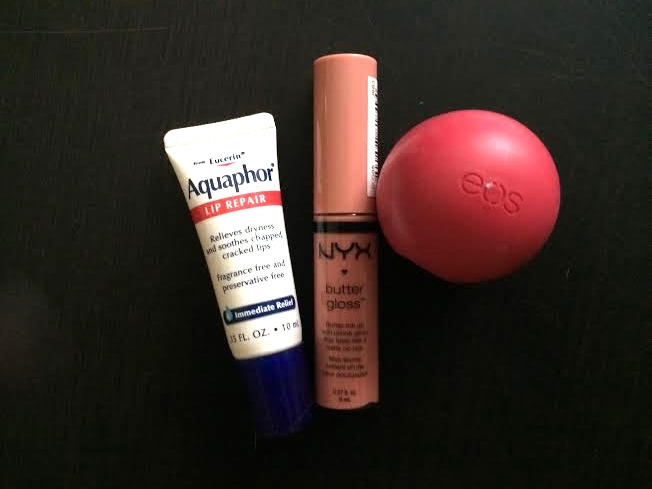 I dont keep my lipgloss in my makeup bag since these items below are typically used every day! I put these in the front pocket of my bag for quick access!